RRCNA presents Promising Literacy for Every Child. The on-demand webcast extends the “Systems Change for Literacy Gains” article in Principal Magazine, written by a team of Reading Recovery professionals. Both resources focus on the six essential components of a comprehensive literacy system. You’ll hear elementary principals, superintendents, and other stakeholders explain how a comprehensive approach to literacy teaching and learning strengthens the entire team and makes a difference for all students. overlapping components of a comprehensive literacy plan. The goals of a comprehensive system cannot be fully achieved unless educators in the school see themselves as a learning community. Community can be achieved when colleagues dedicate time to talk together about their practice and their students and engage in ongoing and intensive professional learning. Good first teaching is essential in a comprehensive literacy system. Effective classroom instruction involves research-based approaches and is based on sound, systematic assessments and ongoing monitoring of each child. Learning opportunities for diverse learners include whole-group, small-group, and individual instruction that builds on each child’s strengths and focuses on active and independent learning. Extensive experiences in reading and writing high-quality texts are necessary within good classrooms. An ultimate goal in the comprehensive literacy plan is the guarantee that instruction is based on assessment of each student’s literacy behaviors and that progress monitoring is used to check on student achievement in a timely fashion. Literacy educators need a way of collecting data on students’ progress so that classroom and intervention teachers can use the information to assess literacy behaviors and make sound teaching decisions. Assessment data can also be used for schoolwide collaborative problem solving. Even with excellent classroom programs, some students will require more-intensive, extra instruction. Each school must ensure effective interventions for these students. 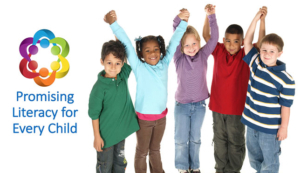 When evaluating an intervention, consider these criteria: documented evidence of effectiveness based on student outcomes; support by high-quality and ongoing professional development; researched procedures and standards and guidelines for implementation; reliable and valid assessment and observation tools; supplements good classroom teaching; daily lessons based on low teacher/student ratio; short-term and based on high expectations. Reading Recovery not only ensures early identification and effective early intervention, it provides support to many components of a comprehensive plan. One-to-one instruction is essential to allow students to accelerate their learning and meet grade-level standard. A school’s literacy leadership team is responsible for creating and monitoring the comprehensive literacy plan and setting goals for literacy in the school. The team meets regularly to examine student data, discuss issues related to teaching and implementation, assess need for staffing and materials, organize professional learning opportunities, promote communication, and monitor and adapt the comprehensive plan as needed. Team members include the principal and representation from all stakeholders involved with literacy learning. Reaching out to families for support and collaboration helps strengthen the outcomes of the comprehensive literacy system. Each school will want to design ways to work with families and the community on behalf of the literacy goals for each child. Although a successful comprehensive literacy system has many interacting components, Reading Recovery plays an important role in that system. For the past 30 years, Reading Recovery-trained educators across the U.S. and Canada have worked in professional learning communities as they taught millions of struggling readers. By providing an effective safety net for children falling behind in Grade 1, Reading Recovery has two positive outcomes. The child no longer needs extra help and the Reading Recovery lessons are discontinued. The child makes progress but does not meet the rigorous criteria of grade-level performance. Additional assessment and plans for the child’s future learning opportunities are also a positive outcome of Reading Recovery. When creating or refining a school’s literacy plan, the following steps are essential. Examine the current status of literacy teaching and learning in the school. Seek agreement among stakeholders in a set of beliefs about teaching, learning, collaboration, and communication. Evaluate the level of expertise of educators involved in literacy teaching and learning. Evaluate the status in the school of each of the six essential components listed below. Design a comprehensive literacy plan for the school. 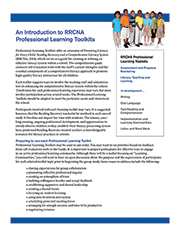 A guide to support schools that are creating or examining current literacy plans is available from RRCNA. 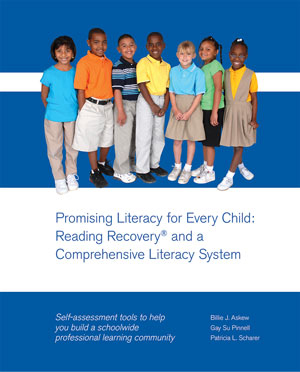 Promising Literacy for Every Child: Reading Recovery and a Comprehensive Literacy System provides practical direction for assessing your school’s literacy practices, includes self-assessment tools for examining each of the six essential components identified, and shares ideas on how to design a plan to accomplish significant improvements in students’ literacy learning. JRR article (PDF) by Pat Scharer. Help educators learn together while creating a shared vision and goals for literacy learning. Designed to be used with the guide, these interactive toolkits include free and low-cost resources — videos, reference guides, journal articles, web links, audio files, and more — organized by topic area. Read Marie Clay’s response to this question. Administrators who have embedded Reading Recovery in their literacy plans call it an ideal fit in the RTI framework. Find out why.